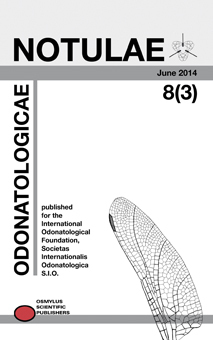 Bulletin, published for the International Odonatological Foundation, Societas Internationalis Odonatologica S.I.O. Notulae odonatologicae is a semi-annual companion publication to Odonatologica, published for the International Odonatological Foundation, Societas Internationalis Odonatologica (S.I.O.). It publishes minor original papers and short notes related to all aspects of odonatology: faunistics, taxonomy, book reviews, ethno-odonatology, etc. The Notulae are covered by Zoological Record and most of the major abstracting services. It is general policy that submitted papers will be refereed by two members of the joint boards of Odonatologica and the Notulae odonatologicae. Publication language is English. Notulae odonatologicae 9(2) has been published on 1st December 2018, including seven papers on 44 printed pages, and was sent timely to all subscribers. All payments should be addressed to Osmylus Scientific Publishers and cover the grand total on your invoice. The annual subscription will be finalized after receipt of the payment, which should preferably be done in Euro or US$. If using your local currency, please ensure that the transmitted sum is equivalent to the current exchange rate. The money transfer must clearly state the name of the subscriber and the number and date of the invoice. Payment of 2019 fees is due on or before 31st March 2019.